Tea bag folding is a paper folding craft. 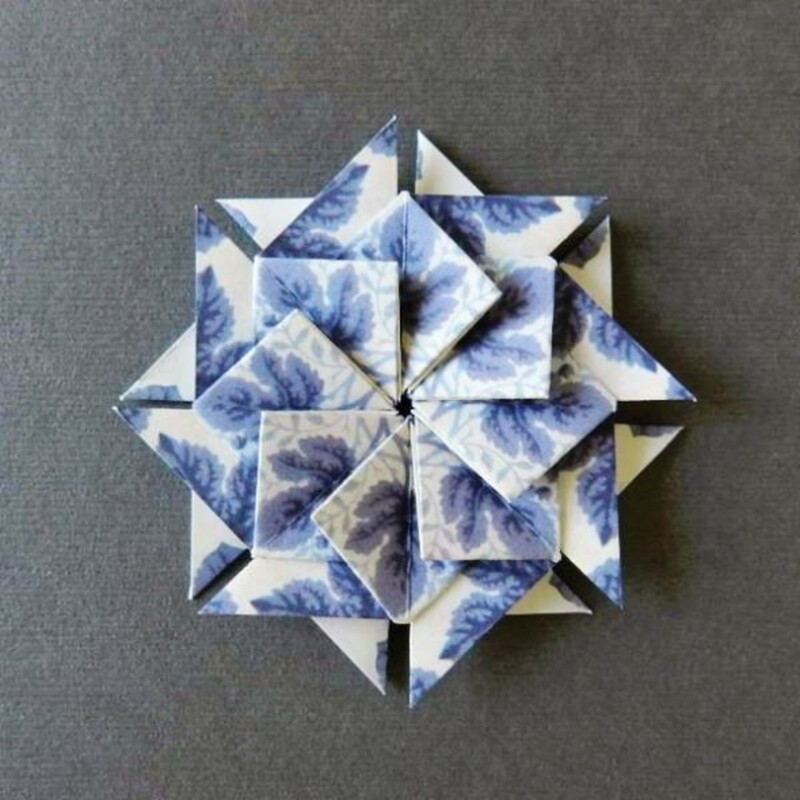 Some enthusiasts compare it to origami because the basic origami folds are used, such as the water bomb and the square base to make flat units interlocked together into a "paper faceted" rosette shape. It is as absorbing as origami because your output can be endless. 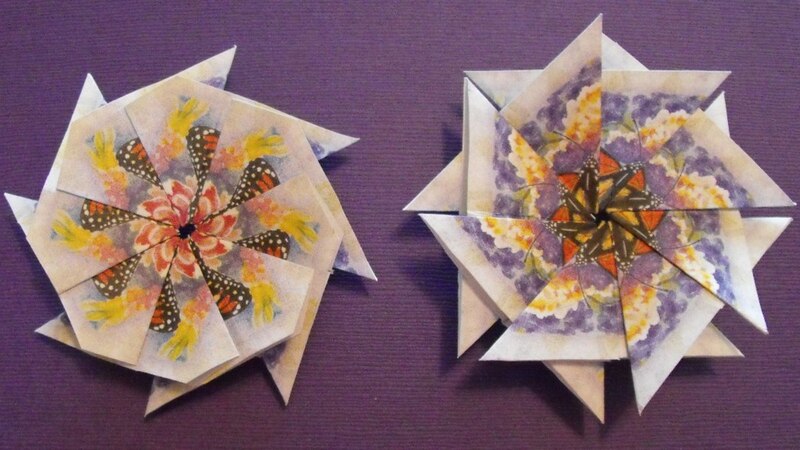 Each finished paper craft project for card making or scrapbooking is as varied as a kaleidoscope. 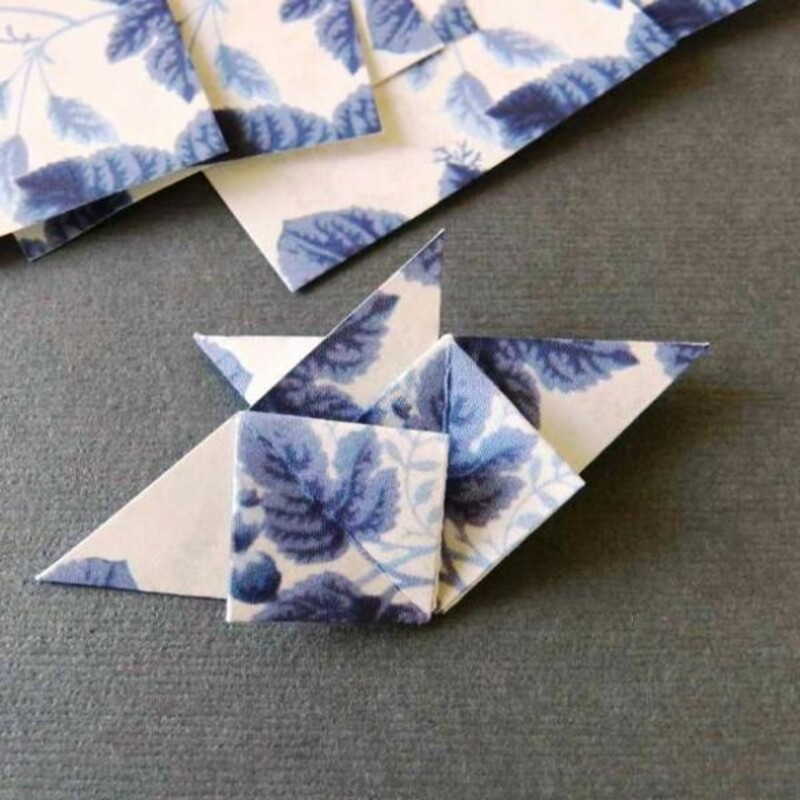 If your curiosity is sparked, read on for information and instructions for three easy flat fold origami patterns to use for greeting cards and other ideas. 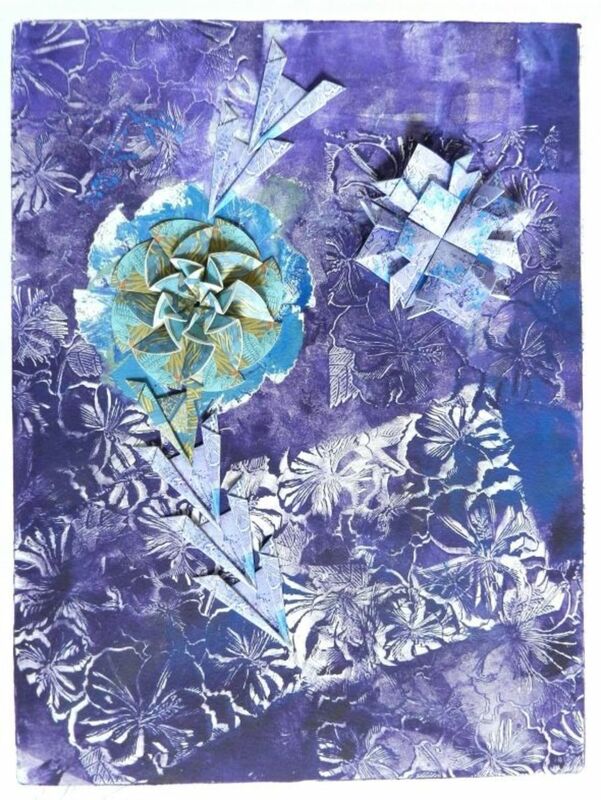 If you feel compelled to see more there are some older book publications and over a dozen websites offering patterns, paper tiles, galleries and project ideas. 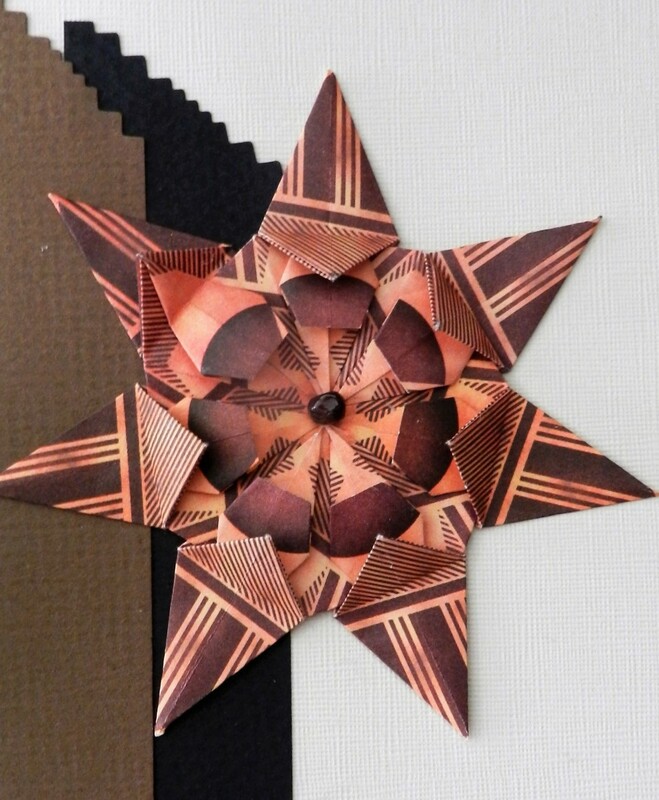 This paper folding craft will keep you busy for some time. I was hooked almost at once. It is basically a flat unit origami technique. 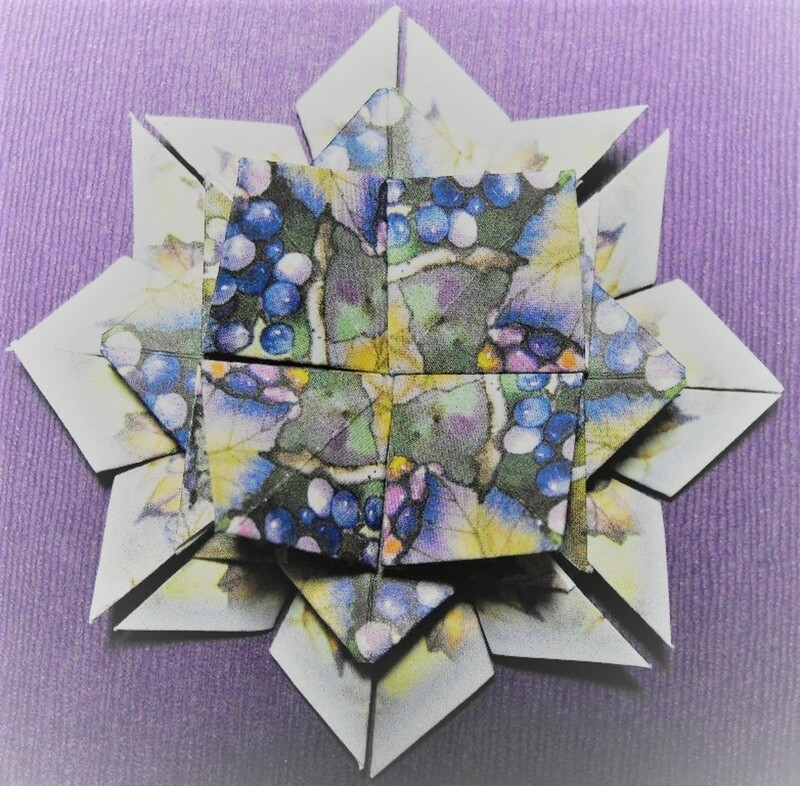 Start with eight squares or tea bag tiles, all printed alike, and fold each the same, then interlock them together into a pie or medallion using a dab of glue. 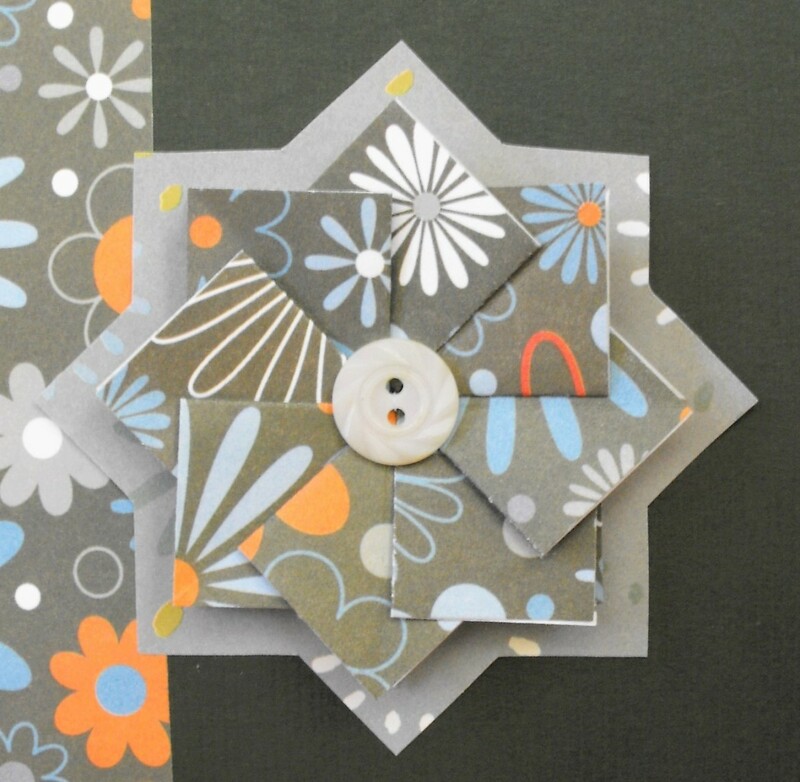 The medallions or paper rosettes can be used for handmade cards, gift tags, or scrapbooking. You decide. Use specially printed tea bag folding paper or any paper that suits your fancy. The rosettes lay flat and are suitable for mounting on scrapbook pages and greeting cards to be sent in the mail. 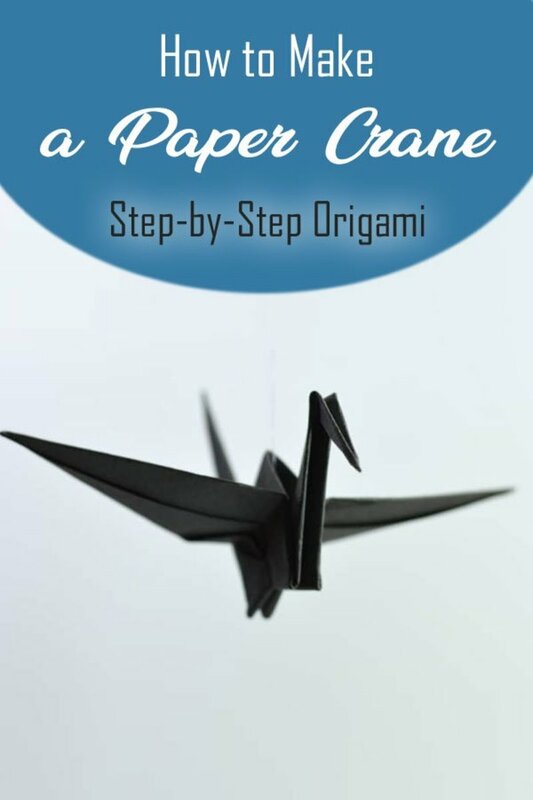 This page is organized with the origami water bomb as the beginning step to creating and making pattern variations of your own. Find some scrapbook paper, colored printer paper or the printed stationery paper for the letters you never sent out. 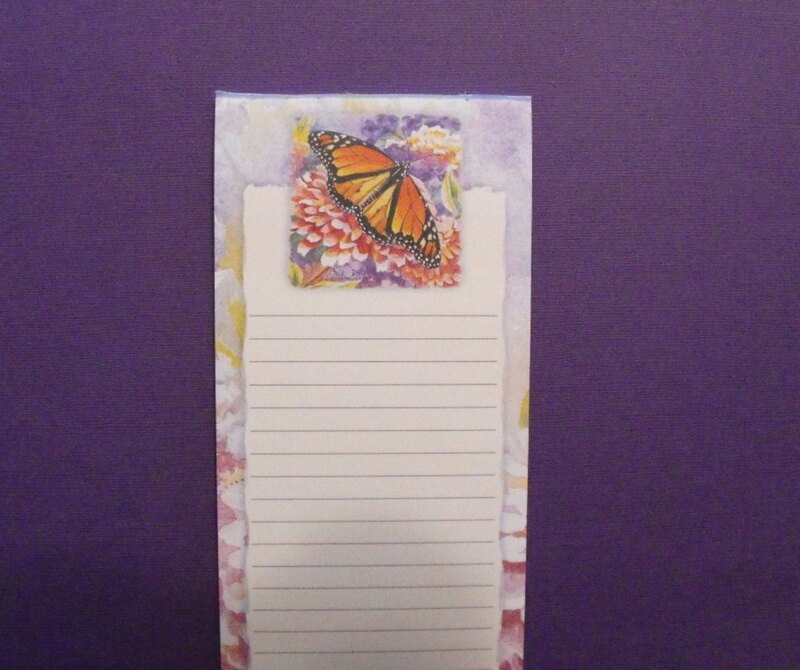 Or use the dollar notepads or list pads in the bargain bins at the craft store. Get out some paper and try the tea bag folding instructions that follow! 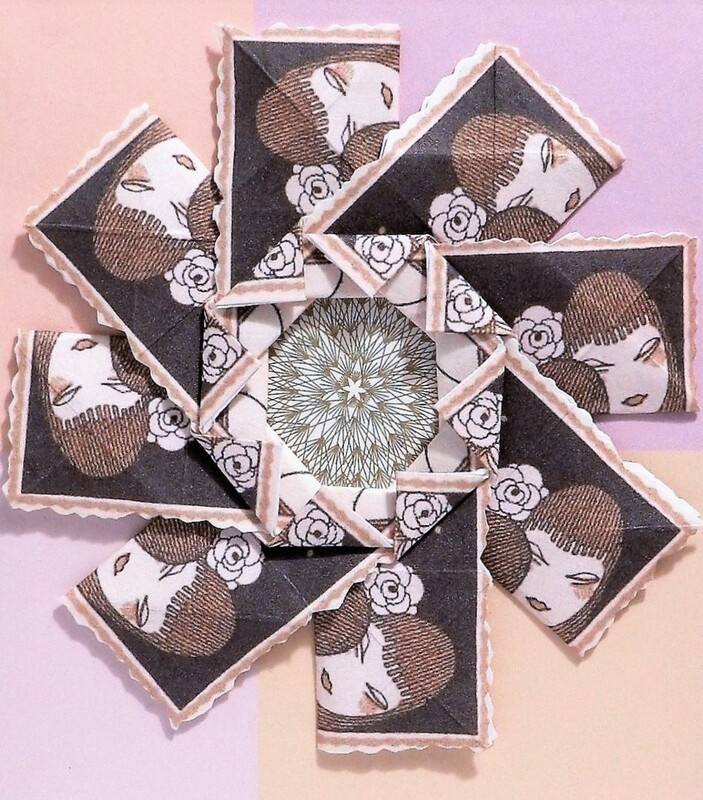 The pink rosette above was made from decorative handmade paper from Nepal. 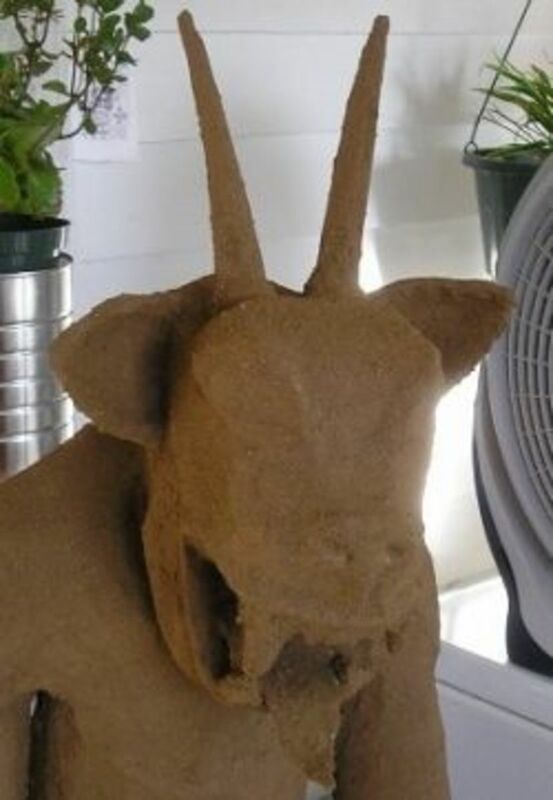 It is made from the lokta plant and is an ancient craft. The variety in the pack makes lovely variations and there are several different colors. 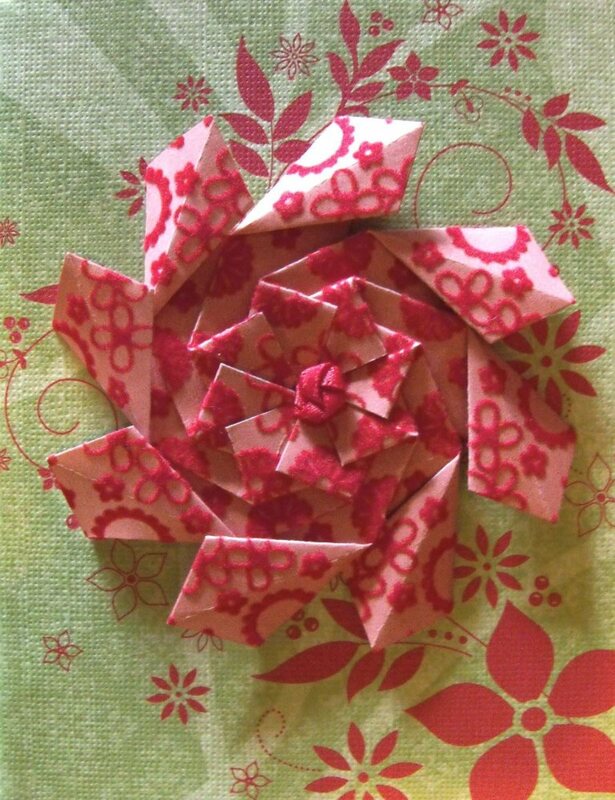 Follow this step-by-step pattern for a tea bag fold medallion or star. This is the very first pattern that I learned from an instruction book bought at a scrapbooking fair. You will need eight squares of paper cut 2x2 inches. I will refer to these squares as tiles and a glue bottle with a tip or a toothpick to dab glue. 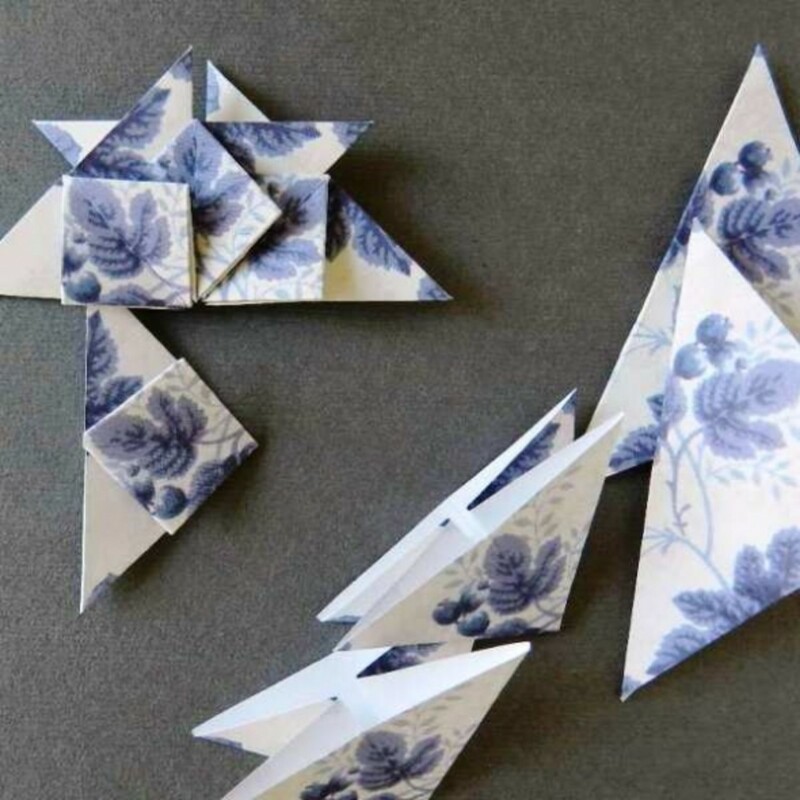 Start your pattern by folding your square 4 ways. Opening the tile up again after each fold as follows. With color side up. Fold corner to corner. Open. Fold the other corner to corner. Open. With white side up. Fold one side to the other side. Open. Fold the other side to side. Open. The folds will look like the picture above. 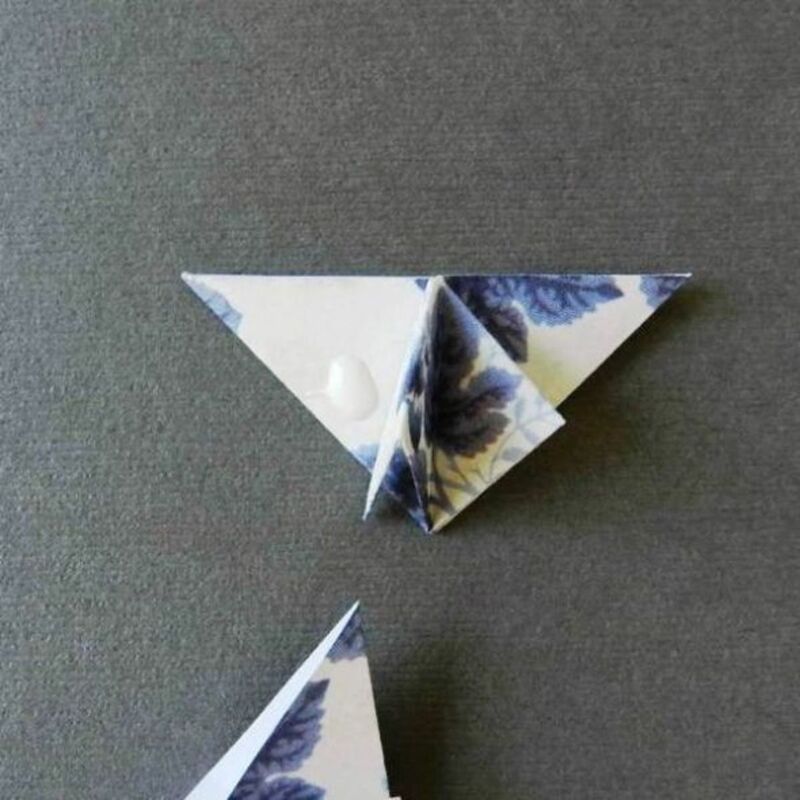 Squish the sides in to create an origami water bomb or double triangle. With your double triangle flat, swing the left side to the right and fold up to meet the center. 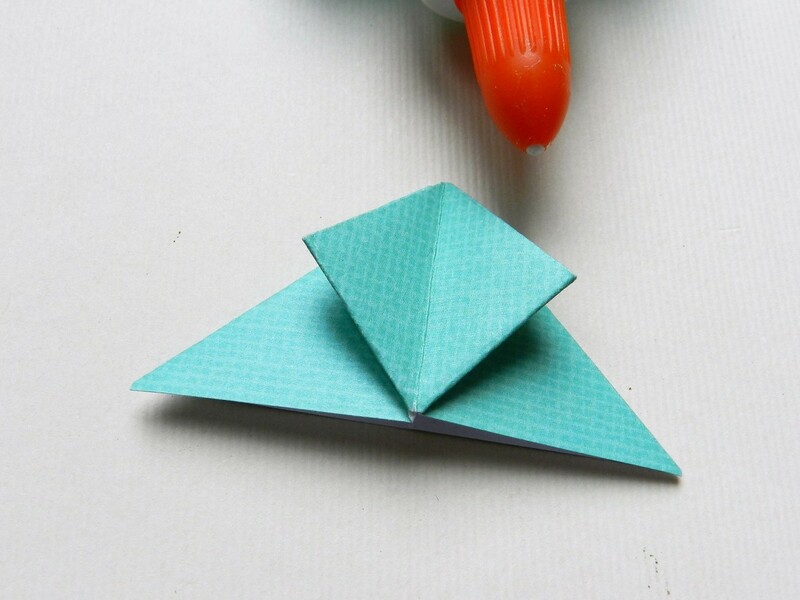 Fold the left tip up to the top of the triangle. Do the same to the opposite side. Take the right side and swing to the left and fold up to the center. 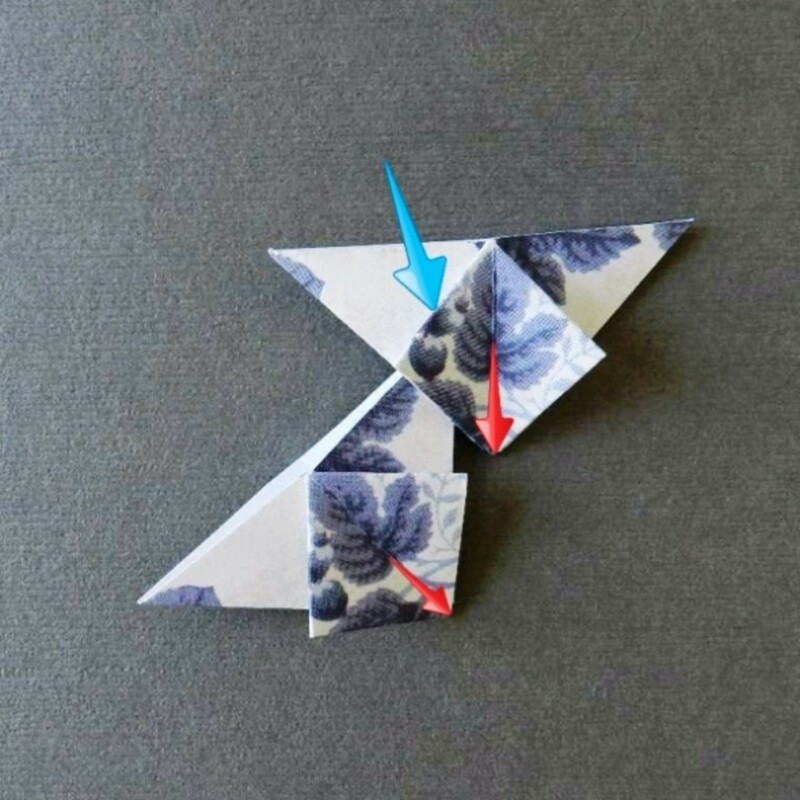 Your folded tile should look like the one above. 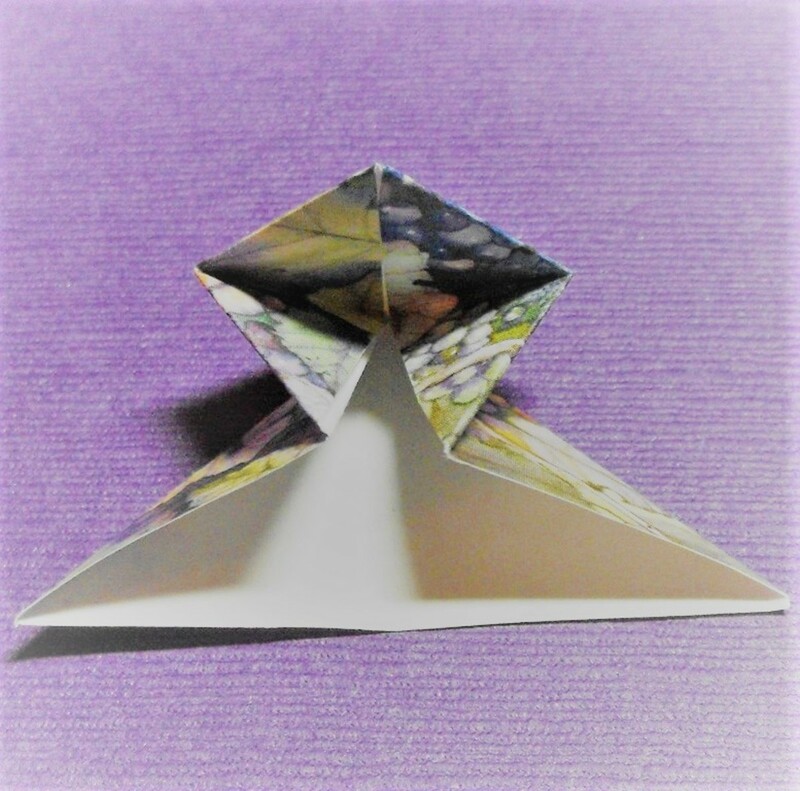 It is a triangle with a pop-up diamond in the middle. Fold seven more tiles the same way. 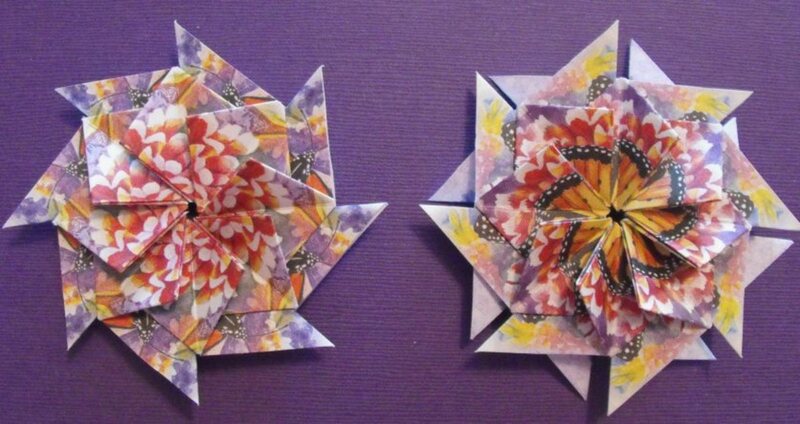 Take two folded tiles and interlock them as shown in photos. Think of one piece in each hand. The point of the piece in the left hand goes under the diamond of the tile in your right hand and meets at the red arrows. Use a dab of glue as shown. This is what the two tiles look like when glued. On the top left illustrates how the tiles may look for a project. Each tile is folded identically so the motif is matching on each tile. 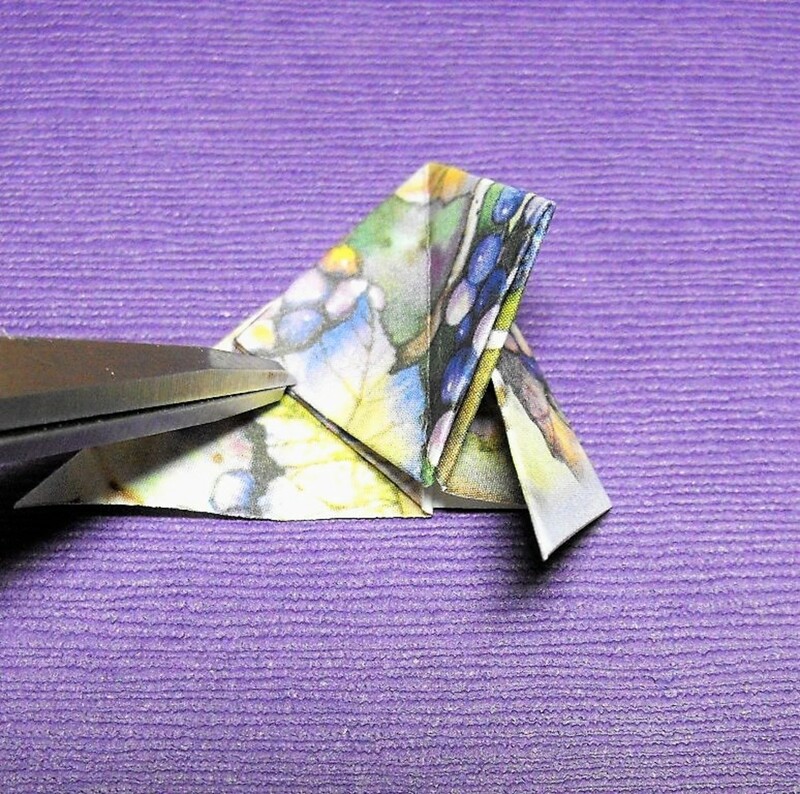 Folding paper should not be something to hinder your creativity. Get what's out there. You do not have to use your printer or that expensive printer ink. Click photos below to get some tips. Additional examples with different papers. I used list pad paper from the bargain bin for these stars. This kind of paper is thinner making it easier to fold. Hint: Do not hesitate to fold because of materials. Try any paper you may have. Look closely above and you will notice that these two stars are opposite. The second star was interlocked clockwise. Hint: Before you are ready to assemble your star try it both ways to see which is more attractive. The stars are turned over and you see the back side. The back is as artful as the front. Here are the two medallions in Lesson One made into 4.24 X 5.5 inch note cards. You can see that all is needed is background paper to mix and match and a greeting card is ready for sending. Add a note in your own handwriting. Why Is It Called Tea Bag Folding? Tea Bag Folding may have been around for a few decades by the responses I have heard at craft fairs. Nonetheless, it is thanks to an artist in Holland that it has worldwide recognition. Tiny Van Der Plas came upon the name as she was sitting with her cup of tea. Of course, her artist mind was whirling and as she was thinking about a greeting she wanted to make, she was also working her fingers with the papers that covered her tea bags. European teas come in fancy papers. I am sure one thing led to another with her friend Janet Wilson. They have written more than three books together about this fun craft. So it may have been around for decades but it is these two women that have given it a new name and sparked enthusiasts everywhere. Especially in England, Australia, and the United States. Another variation of the water bomb fold. Start with the water bomb base following steps 1 and 2 above. Unfold and turn the white side up. 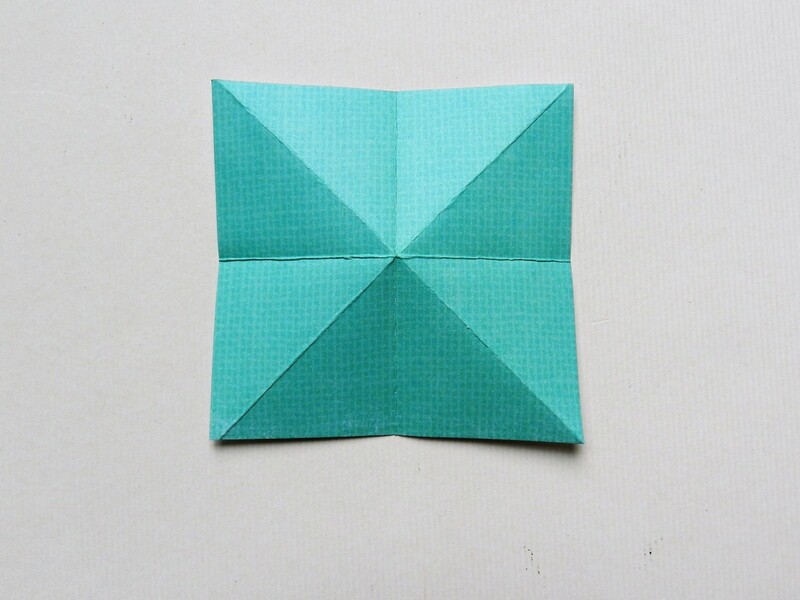 Make two folds toward the center as shown below. While folding the top half of the square down squish the sides in to create the fold above. 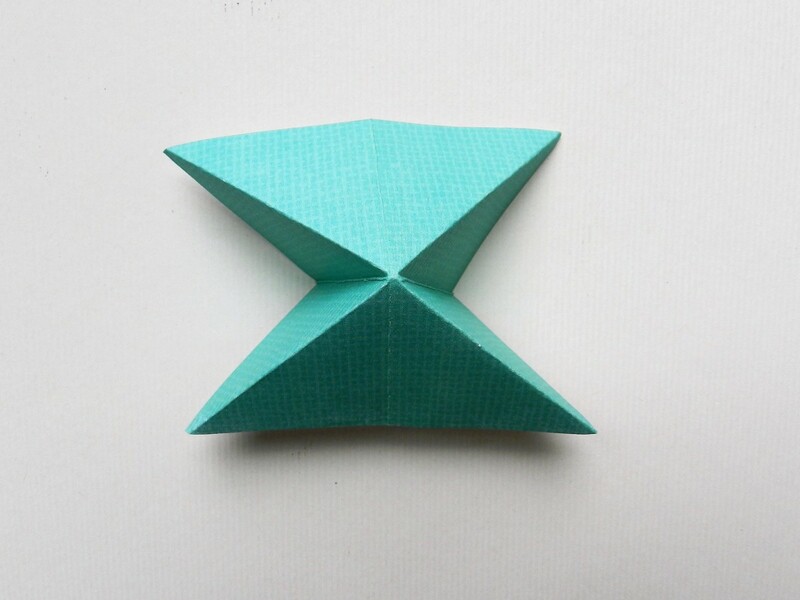 How fold tips at the bottom of the triangle down and toward the center on both sides. Your tiles should look like the one above. 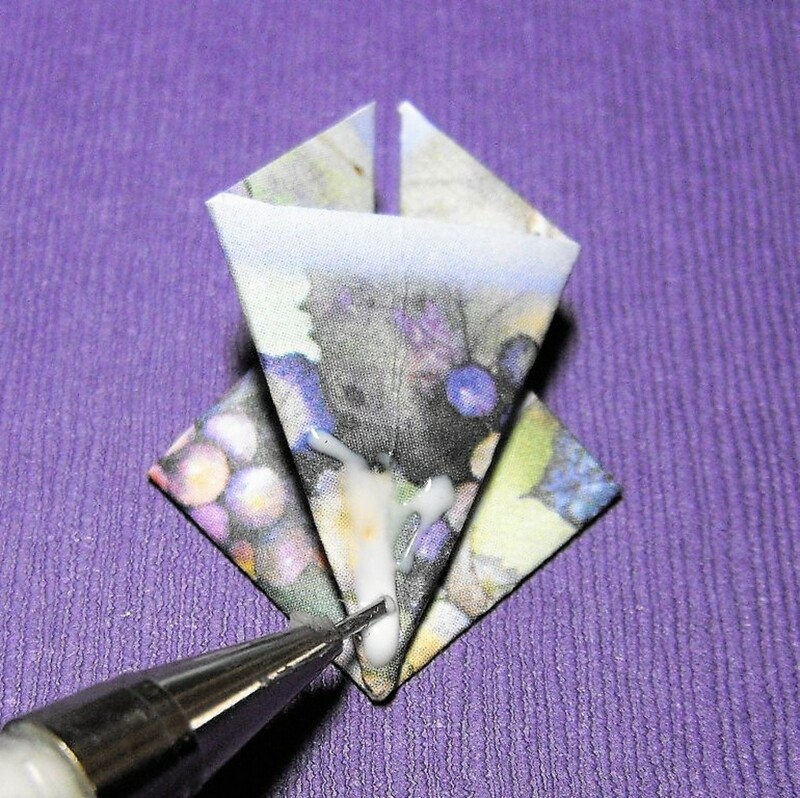 Cut a scrap of paper into a one-inch square and glue four units onto it. 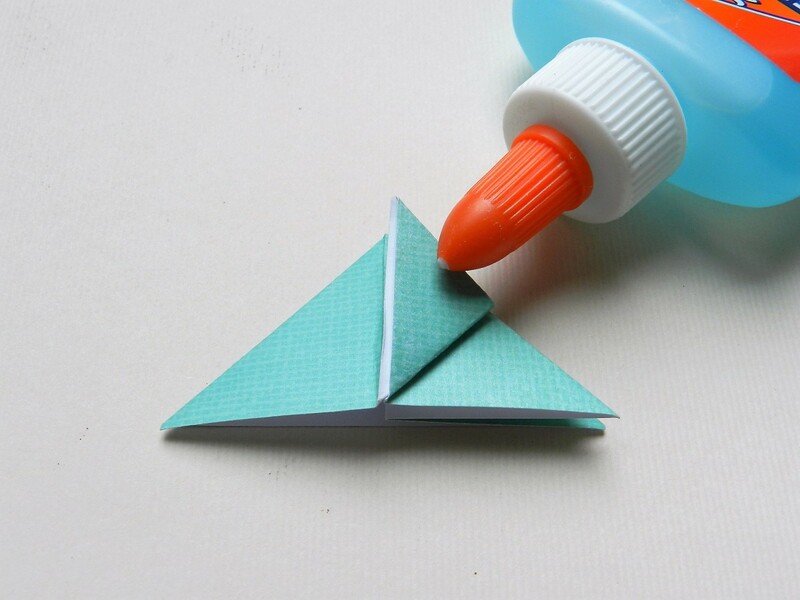 Dab the glue at the tip of the triangle on the back as in the photo below. The diamond shape needs to be free of glue. You will slip the other units under them. Dabbing the glue in the same manner as above, take the four remaining units and slip them under the flaps of the ones already glued onto the square. Your finished project should look like this. Gently bend up the four top units so there is a valley effect in the center. 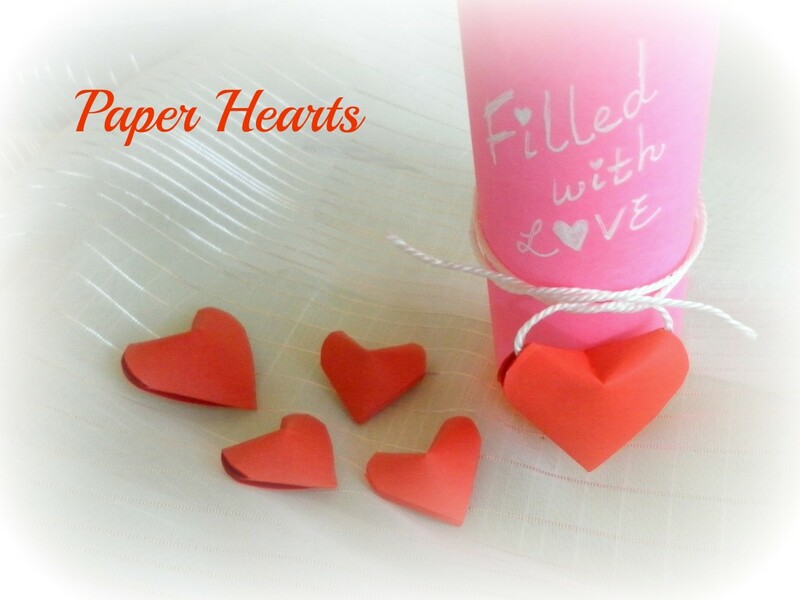 Idea: Use tiles 3 inches and scrapbooking paper that is a heavier thickness. 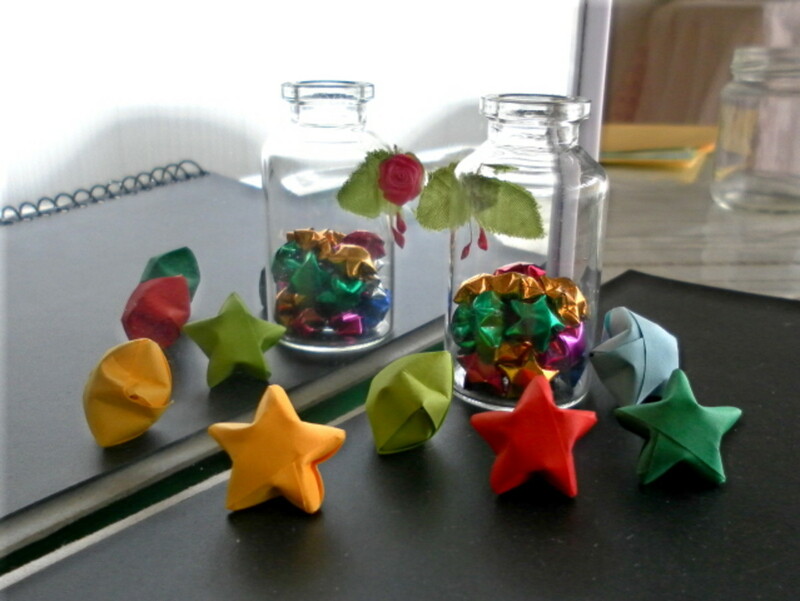 Your star will be three dimensional and idyll as a gift box topper. The project we just finished is the card on the left. 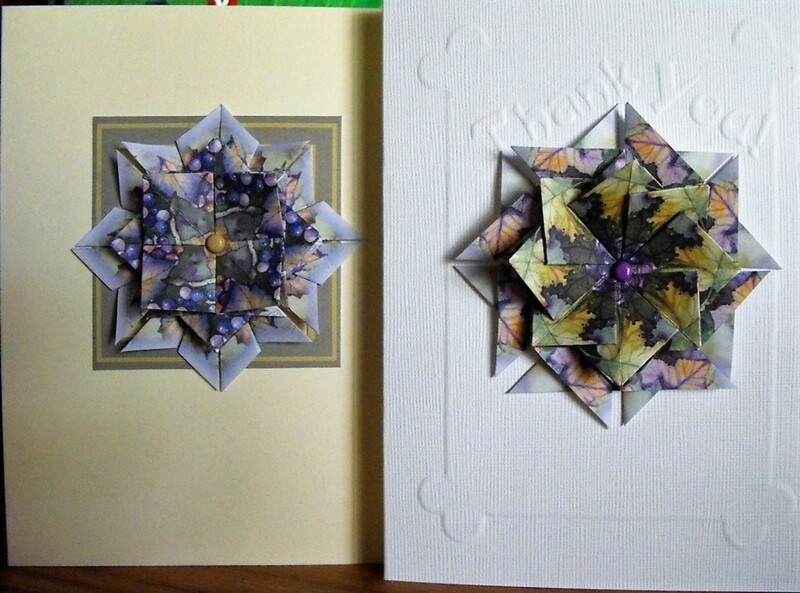 The card on the right is Variation One. This is an example how the same paper can look different with folding variations. This tea bag fold is easy. Give it a try. Sometimes a video is best for some beginners. I'm Curious--How Many Tried Rosie's Fold? After seeing the video above. How many of you gave it a try? Did everyone stop after one project? Which statement best fits you after seeing the video above. I made a teabag fold rosette. I made more than one teabag fold rosette. I think I need more help with tea bag folding. Tea bag folding is not for me. 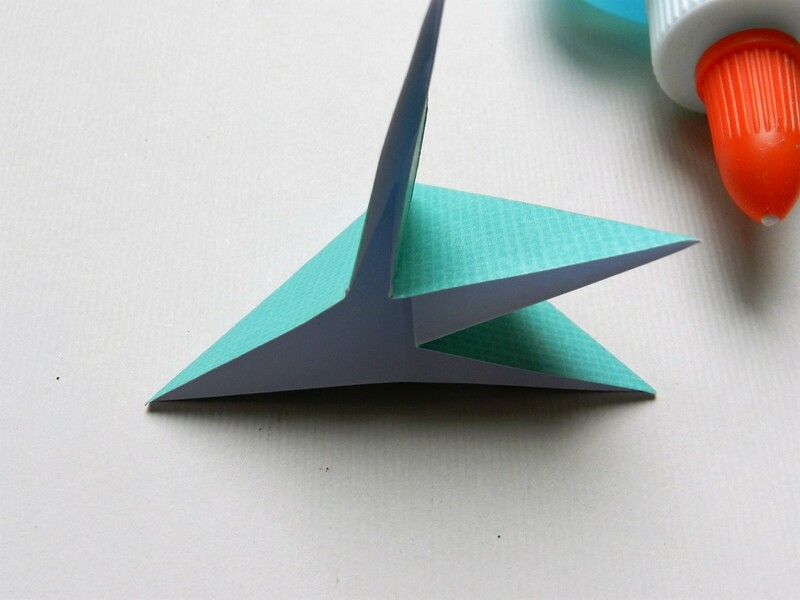 Start with the basic origami water bomb, use some imagination, and you are armed with many projects to keep you busy. Another water bomb project can be viewed at Tea Bag Folding Christmas Tree Pattern with instructions for a holiday Christmas tree. If you have a question or comment on these lessons feel free to leave one in the section that follows. 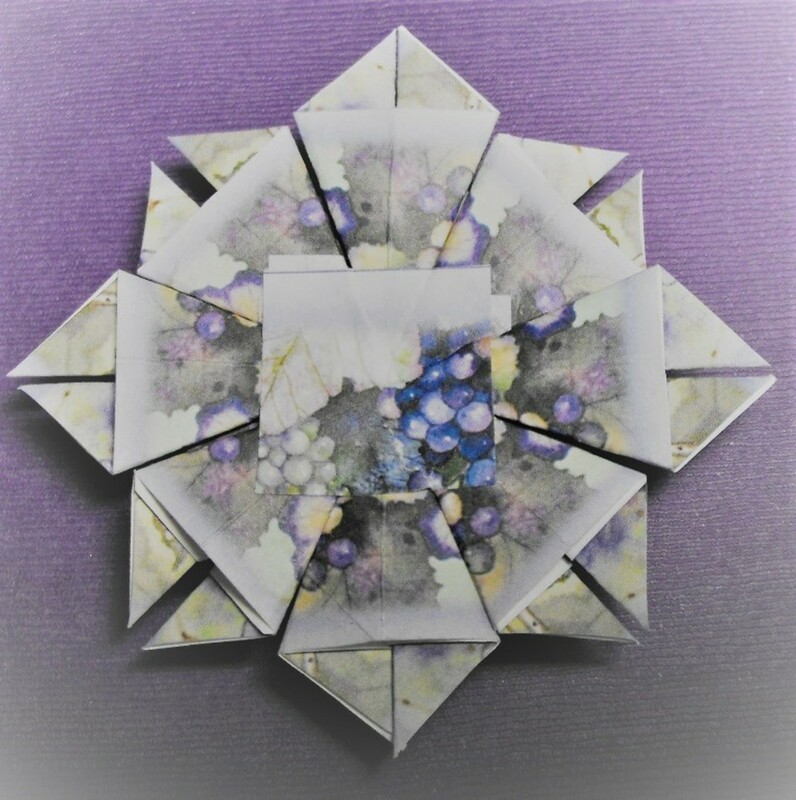 To find out more from the Internet search for tea bag folding paper, flat unit origami, and tea bag folding. 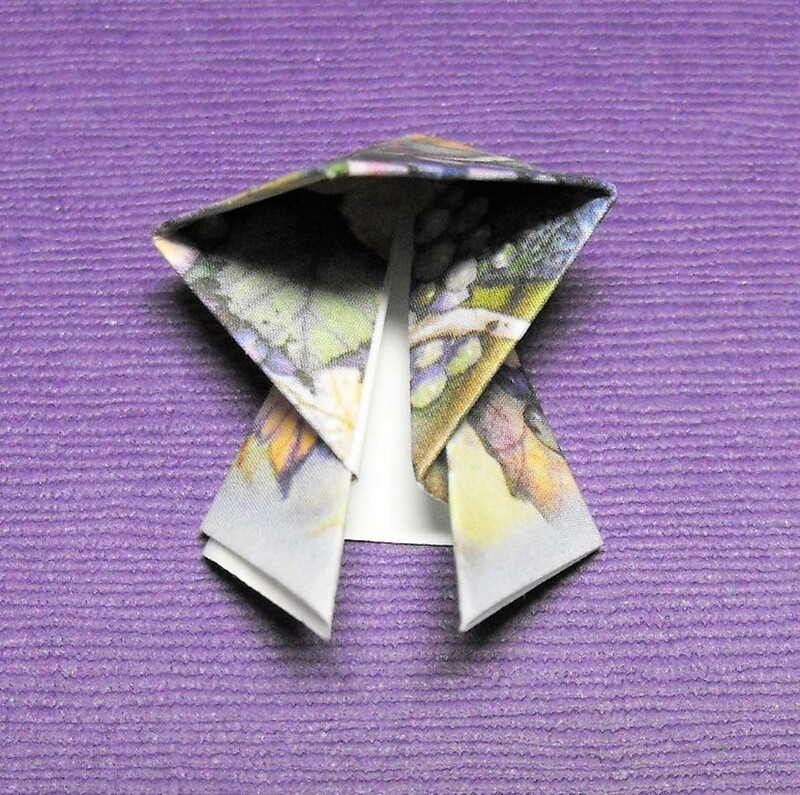 Did your introduction to tea bag folding leave you folding paper? I'm afraid my hands are too stiff these days to add one more hobby requiring intricate use of my fingers, but how beautiful these designs! I chose this page because I had read another of your tea-bag-folding pages the other day and was curious to learn more. Thank you for including a segment on the origins. What an interesting and beautiful art medium. 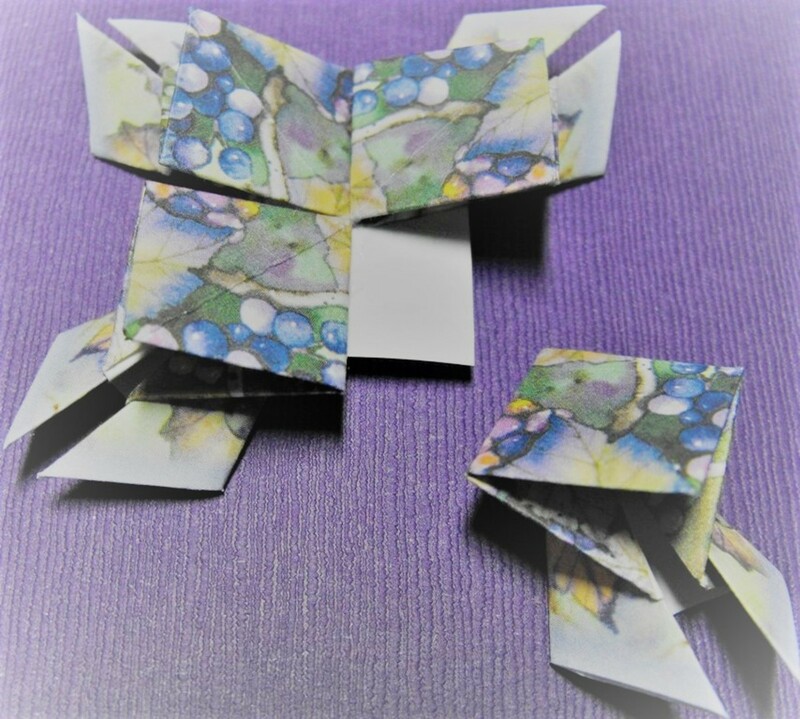 Teabag folding is such a fun craft, I have done it on a number of occasions and enjoyed the beauty of the designs that can be created just by folding. I'd never heard of tea bag folding! Some of these are very beautiful, and your illustrated instructions are wonderful. Itching to give it a try after work today! I'm so impressed with what can be achieved with this craft I reading this has made me want to give this a try. Interesting read. 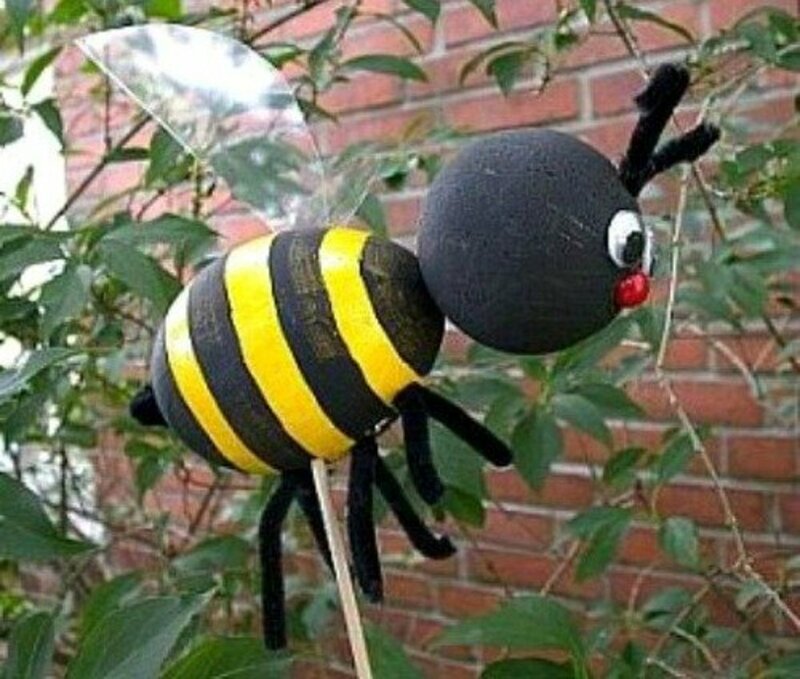 This is such a great craft! I had heard about teabag folding but didn't realize how much you could do with them. Like the classic quilting square patterns, you can do so much with them and they are just beautiful. Thank you so much for all the how to information! I'm looking forward giving this a try. I love tea bag folding. 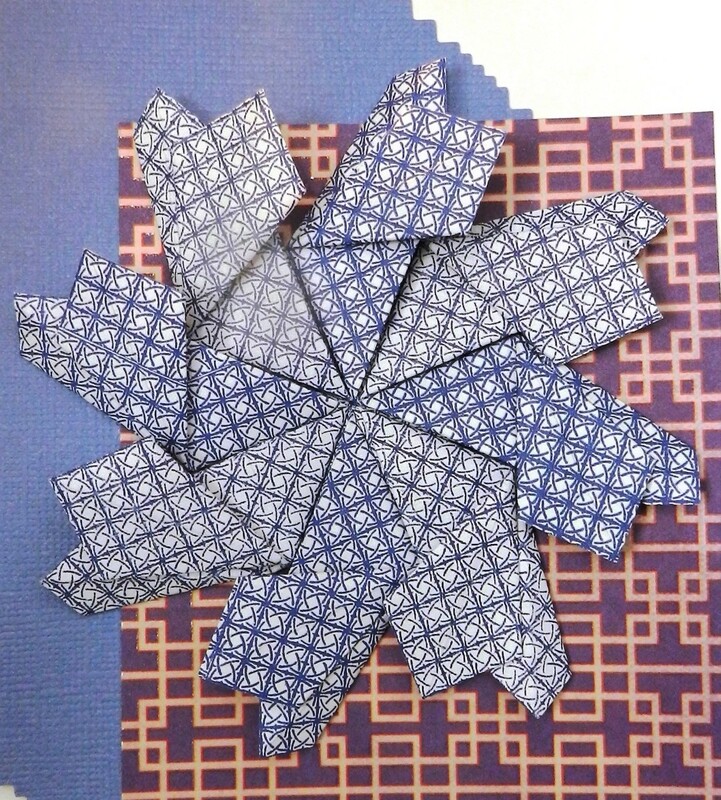 The transformation of putting the little folded patterned squares together is exquisite. I loved seeing the tutorial. Now I want to start saving envelopes and having mygrandchildren use my stamps to prepare them for folding. One day we will practice making tea bag folded cards. Thanks for the new direction. @paperfacets: Yes, I do have that booklet and I found it! @paperfacets: Thank you so much. I think I already have this book somewhere. I need to look for it. If I don't find it, I will buy it again because I just love this fold. Keep up the great work on this site. The fold you are requesting is one of my favorites. 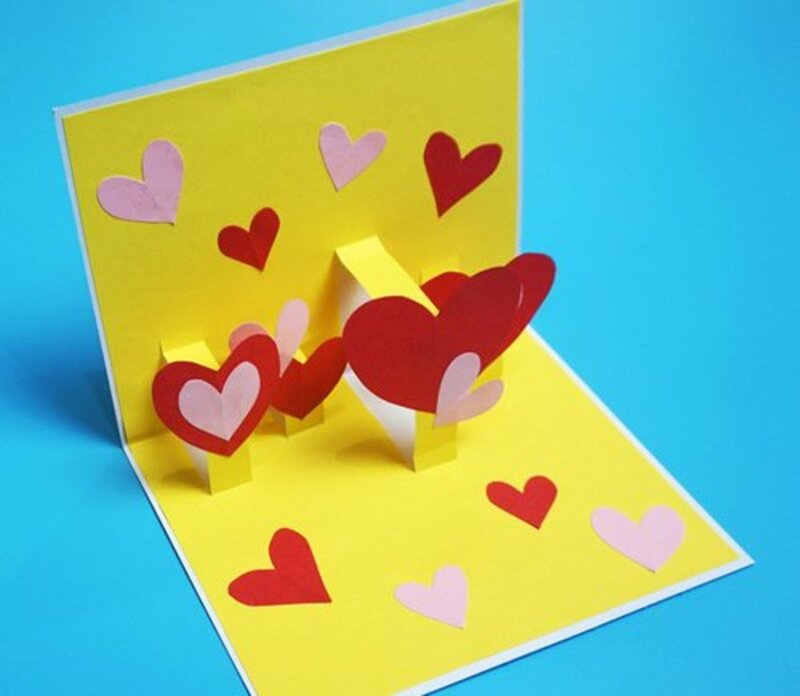 There is a standup 3D effect that I like to use for cards. If you want it to lay down use very thin paper. 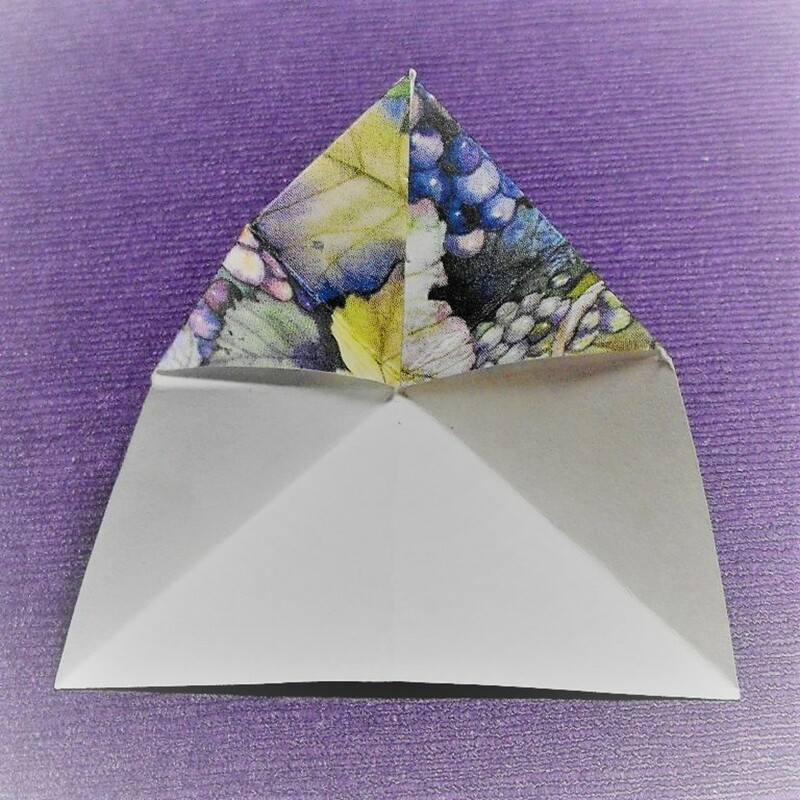 I learned this fold from "Memory Folds, Great Ideas for Scrapbooks and Cards." on pg. 6 by Terri Pointer. I have it listed above in the book section #5119 with some extra notes of what is available at amazon. I am sure you will find additional patterns in this book because many of them are not in any other publications and I have not seen all of them on the internet. 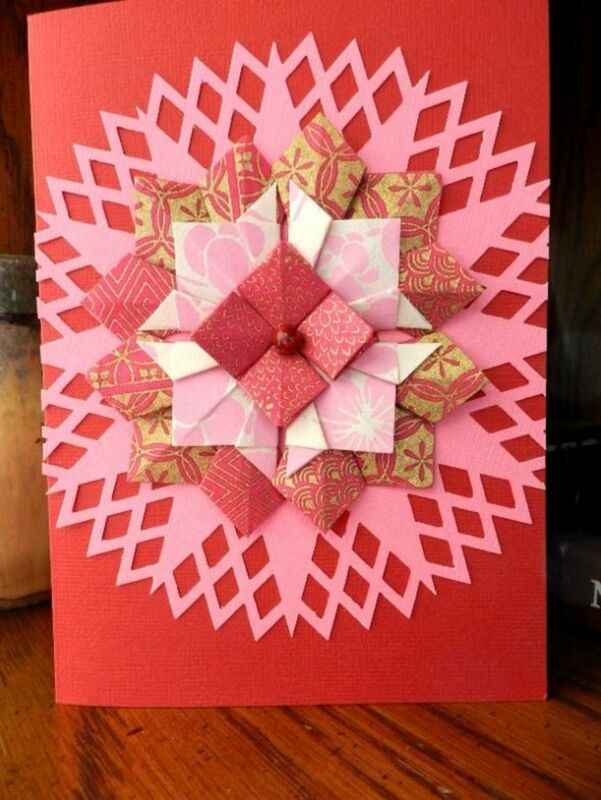 I would like to know what fold you used for the Pink and Yellow star. It's the second medallion in this post. @anonymous: This is a fun craft. The pattern in the intro photo is from the book "More Tea Bag Folding by Tiny Van Der Plas and Janet Wilson. There are variations of the pattern in the book and lots of ideas. If you are new to the craft, you may want to start with an easier pattern. Try www.handcraftedgreetings.com/tbtristar.php for a slightly easier star. Hi, I had never heard of teabag folding until I stumbled across your site while looking for a project for children to make that will be auctioned off to support their school. I love it! 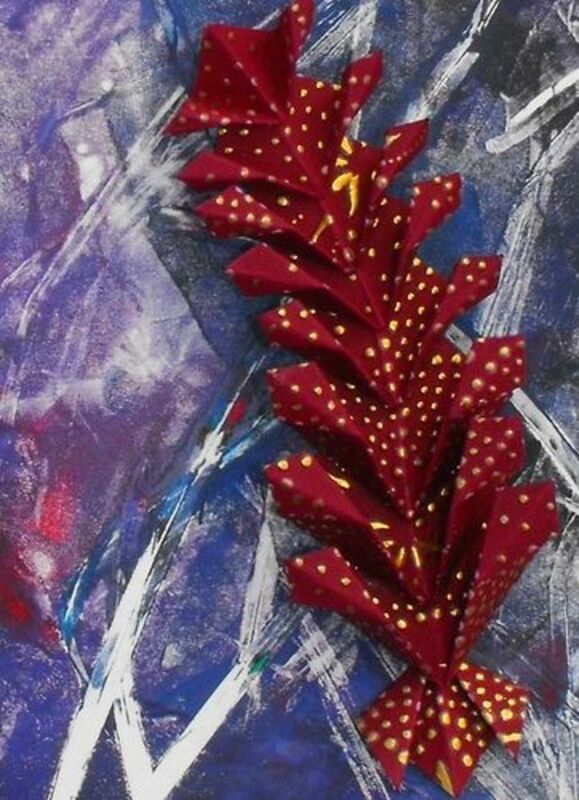 I am wondering if you have directions for the pointed star that is featured at the beginning of your post. I would appreciate it! Love this! 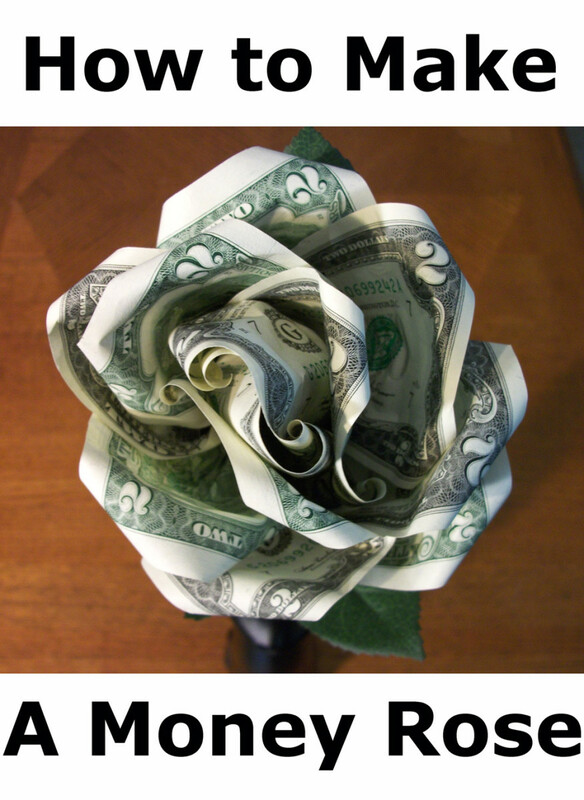 I tend not to be very good at origami, but this has more practical applications. I'm imagining paper decorated with kids' drawings, turned into pretty greeting cards for grandparents . .. Very cool. I've completed a few origami projects with money, but I've never thought about using something as simple as a teabag. Also I really appreciate your tip about the template. I always wondered how people knew what would be displayed in the finished work. I'd never heard of this but I'm itching to give it a try - I've got loads of pretty origami papers from the 100-yen shop! 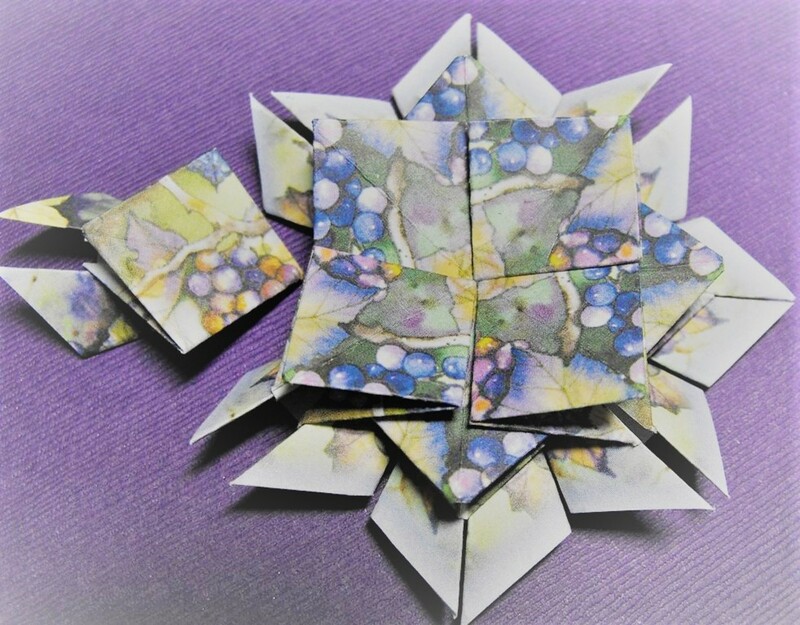 Some of these designs would make gorgeous jewellery - I've made origami jewellery in the past by varnishing the finished piece, I think that would work the same. Absolutly loved the teabag folding patterns, I run a craft group in spain. All my ladies were new to teabag folding and as i had just purchased a cuttlebug they had great fun embossing and cutting out for cards. Results very good. Thankyou. Brilliant page! I love teabag folding. 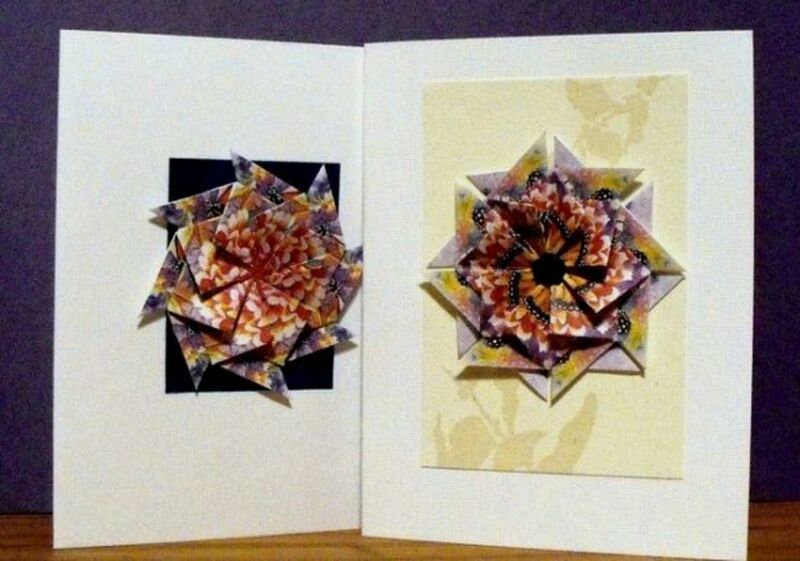 My favourite variation is to do a Christmas wreath on cards for the festive season. [in reply to kathy cooper] P.S Kathy I tried emailing you, but I had trouble with kyleerabbit@comcast.net. Would not send. [in reply to kathy cooper] I have had a few requests for the seahorse pattern and I am keeping the pattern in an artist's locked box for now. But I know what you mean about moving beyond the eight tile configuration and when I did it was a whole new creative outlet. Thank you for visiting my lens and stay tuned we will have new and fun paper folds to do.